Obituary – Koch, Alice Elizabeth (Kirtley) « Perry High School Alumni Association, Inc.
Alice E. (Kirtley) Koch, 84, Perry, died at 9 a.m. Thursday, September 3, 1998 at Perry Green Valley Nursing Home. Funeral will be at 10 a.m. Saturday at the Church of Christ with Mark Uhlman officiating. Burial will be in Grace Hill cemetery under direction of Brown Funeral Home. Mrs. Koch was born at Enid on April 11, 1914 to Charles Thomas and Frances Jane (Sokol) Kirtley. Her grandparents made the Cherokee Strip Run of 1893. She was a 1933 graduate of Perry High School. 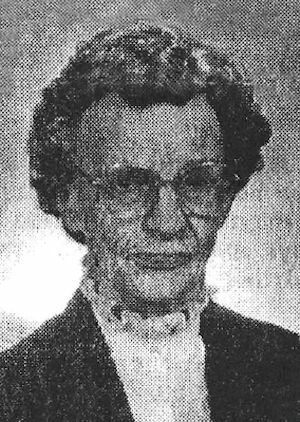 A former member of the First Christian Church, Mrs. Koch recently became associated with the Church of Christ. She was a lifetime member of the Noble County Cherokee Strip Historical Society. She enjoyed tending her garden. Among survivors are three sons and two daughters-in-law, Clarence and Jean Koch and Larry Koch, all of Perry, and Charles and Ina Koch, Fort Davis, TX; two daughters and sons-in-law, Marian and Art Chitwood, Stillwater, and Nancy and Randy Treiner, Perry; two sisters and a brother-in-law, Mary Bocox, Medford, and Janice and Carl Endres, Edmond; six grandchildren, Carla Robbins, Bruce Koch, Ben Treiner and Katie Treiner, all of Perry, and Cary Chitwood and Melissa Nixon, both of Stillwater; and six great-grandchildren, Christopher, Ryan and Kayla Robbins, Levi and Jeffrey Koch, all of Perry, and Noel Chitwood of Florida. Mrs. Koch was preceded in death by an infant daughter, one grandson, three sisters and four brothers.